Since I was a little girl I've never really liked cow milk and always had problem digesting it. Needless to say I was pretty happy when my doctor told me I was intolerant to cow milk. I could eat dairies (yogurt, cheese...) but should find an alternative to cow milk. 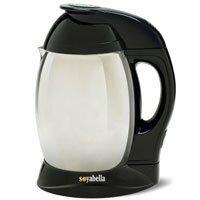 I decided I could make my own milk from nuts and I found the perfect machine to do that : The Soyabella. It's a versatile machine that can make soya and nut milk and also soups, porridge, rice paste though I've only made soya and nut milk. I mostly do raw milk with soaked almonds, hazelnuts, cashews etc.....It's easy, fresh with no additives and so good. I just just soak 80g of whole organic almonds for approximately 12 hours. I then peel them and place them in the stainless steel cup with the fine screen. I pour 800ml of water in the stainless steel chamber. I close the head unit, plug the machine and press mill. Once the milling stops, I press mill again and repeat this for 5 times. And my milk is ready. I've made soya milk a couple of times and found it sweeter, milder and a lot nicer than the store bought ones. The tofu I made was also very good. managed to make small quantities of nut butter with this accessories and it was really good. The machine is easy to use and to clean. 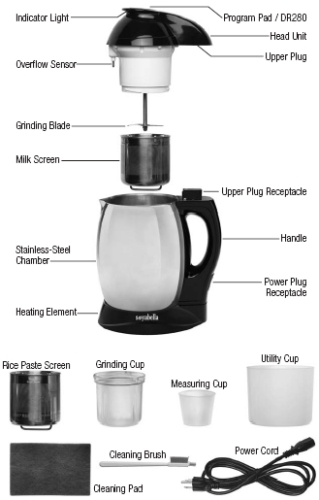 It has three programmes: Milk-mill-paste that allows you to make all the above.The manual that comes with it is clear and straightforward. A Robust machine that works well, exactly what I like. I bought mine directly from Tribest in the UK but it can also be found on other UK websites like UK Juicers or Just Nutrition.